Pass to Post might call itself the best tool for surfing the web, but you should realize sooner or later that it is completely worthless. The first sign that this program is potentially unreliable is its own claims to offer the best services. If it truly was the best tool around, you would have heard about it by now, and it would not be introduced to you by unfamiliar installers or via some obscure website. Unfortunately, many computer users do not take this into consideration, and they pay attention to the alleged benefits brought by this program rather than the risks associated with it. Needless to say, if you are this careless, you might invite much more malicious threats without even knowing it. Although it might not be the worst of malware, we suggest removing Pass to Post from your operating system as well, and you can learn why this is important by reading this report. The category that we have placed Pass to Post in is adware. This term stands for “advertising-supported software,” and, as you must understand, this software can display advertisements. Unfortunately, we have found that injecting ads is the main service of this suspicious program, which makes it useless for you. Sure, you might find some of the deals and offers shown attractive, but you have to think twice before you interact with them. These deals and offers might have been created by unreliable parties, and clicking on them could be risky. You would face the same issues if you downloaded Innovate Direct, Elements Peruse, Discovery App, and other advertising-supported programs created using Injekt. This engine could have been used by different parties, but all apps created using it look identical and work in the same ways. For example, all of them have official websites, such as passtopost.com, that do not provide installers. The fact that an official installer for Pass to Post does not exist raises a few questions. For one, how is this advertising-supported program distributed? As mentioned previously, it is most likely that this app will be provided to you by a third-party installer. Unfortunately, some third-party installers might spread this adware along with many other unreliable programs, which is why you have to be careful when downloading the software you are interested in; especially if you are using the services of unfamiliar software distributors. Because there is a possibility that you have downloaded this adware along with malware, we strongly advise installing a scanner to inspect your operating system. In case malware is detected, do not ignore it because your own virtual identity and the security of your Windows system could be jeopardized. If you are not sure you can handle the threats detected manually, implement a trusted anti-malware tool. The main reason you should delete Pass to Post from your operating system is to prevent being scammed. Unfortunately, the advertisements injected by this adware could serve malware creators and distributors, as well as schemers. The bad news is that this adware collects information about your virtual activity, which makes it easier to provide you with more attractive ads. As you can guess, attractive offers could be used to trick you into interacting with cyber criminals. If you want to avoid this, you should stay away from all ads, and you should eliminate the unreliable program responsible for injecting them. Note that additional ad-supported programs could be present on your operating system, which means that you might continue seeing ads even after you remove Pass to Post from your PC. A reliable malware scanner can help you figure this out. If you are looking for a challenge, we have one for you. Although it is possible to remove Pass to Post by uninstalling it via Control Panel, we think it is a good idea for you to follow the steps below. If you do, you will learn how to delete registry keys – if you do not know this already – and files that belong to this adware. Of course, if other threats are active, you might want to install an anti-malware tool to catch and eliminate them quickly. The longer malware stays on your computer, the more damage it can it do. If you need our advice about anything regarding this threat or the protection of your PC, contact us via the comments box below. Launch the RUN dialog box by tapping Win+R keys. Enter regedit.exe into the Open box and click OK.
Now move to the top of the Registry Editor and click Edit. 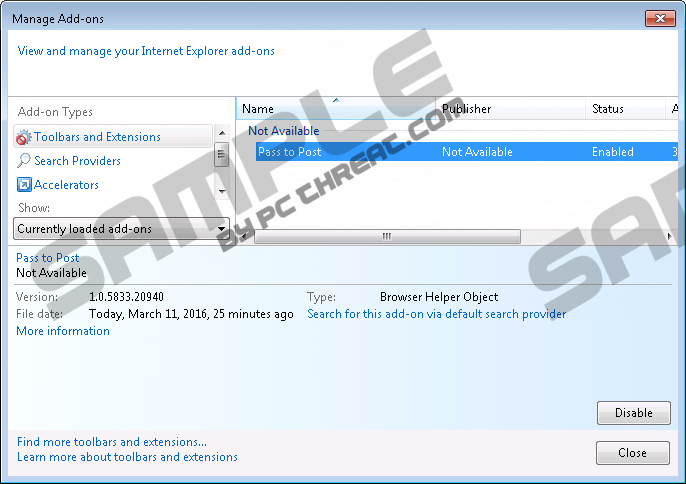 Launch the Explorer window by tapping Win+E keys. Enter %Program Files% (or %Program Files(x86)%) into the address bar. Right-click the folder named “Pass to Post” and select Delete. Enter %Temp% into the address bar and follow step 8. Enter %AppData%\Roaming\Mozilla\Firefox\Profiles\ into the address bar. Open the folder with your unique profile ID and then open the Extensions folder. Right-click and Delete the file named "firefox@www.PasstoPost.com.xpi". Quick & tested solution for Pass to Post removal.